okay making two baby quilts. one boy and one girl. not sure what pattern to use yet. 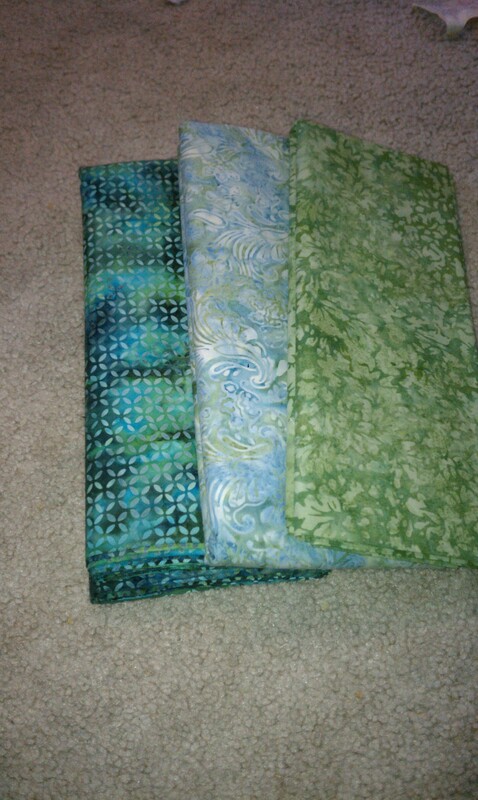 the pics are of the fabrics i think i want to use. the one in the pic with the purple fabric that looks like earings is my fav. almost dont want to cut it up. what patterns would you suggest for the two quilts. i can add fabric or take away. i plan on adding another blue to the second pic maybe. not sure yet. it went together very quickly. Your fabrics are beautiful. But they don't say baby quilt to me. Maybe use something other than batiks? I know I didn't answer your question. I love your fabrics - a lot of new moms don't really want something that reads BABY. I recently did one called Science Fair by Jaybird designs and it was a big hit. 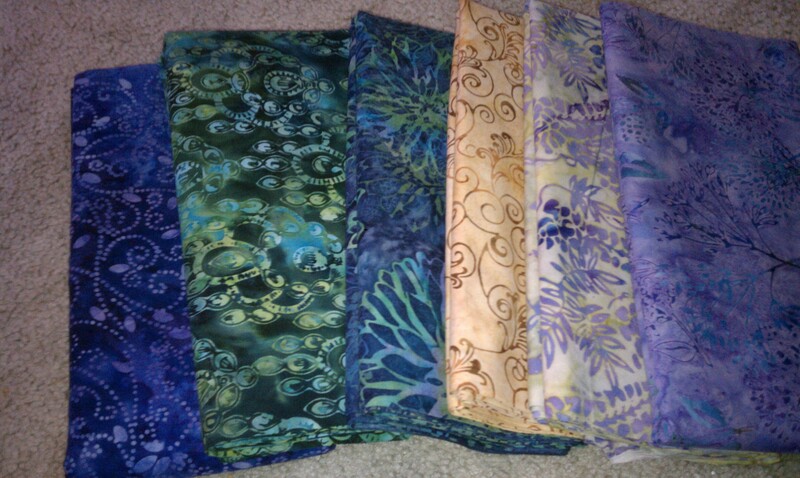 I love your fabrics, and I think they will make wonderful baby quilts. I just made one that really yells "Baby!! ", and I kind of wish I had done something like you are planning. I don't know the new mother at all, but the husband is my nephew. I hope they like a babyish baby quilt!! Here are a couple of batik baby quilts that I've made. 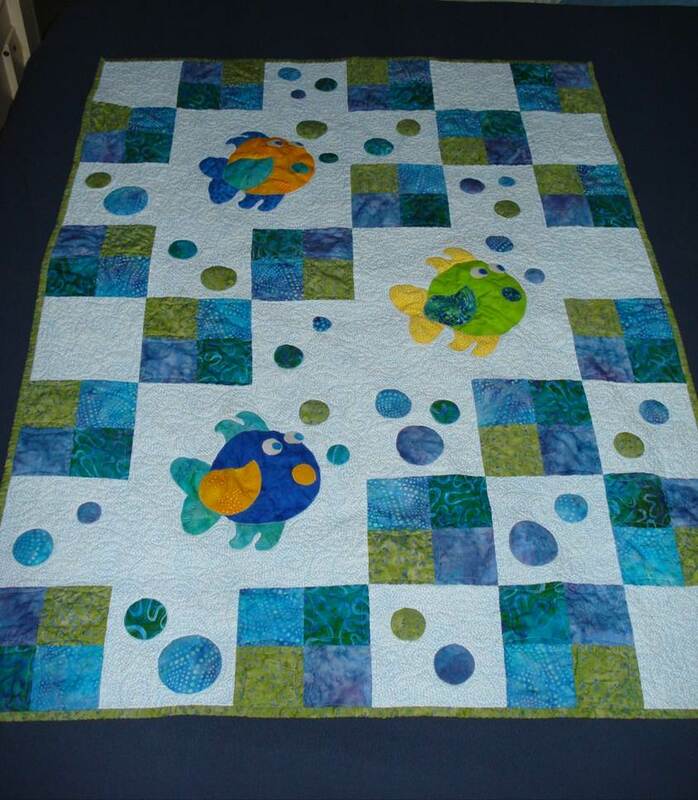 Ocean colors make great fish/frog/turtle quilts. These quilts are so cute! I love them. Love your quilts. Batiks are hard to use for a baby quilt. I know because I just finished one today. I especially like the one with the fish on it. I'll bet it was a big hit. these might be for me. i am hoping to be prego but things noit good. go in Thursday . TTo see.o so to taky my mind off things planning a baby quilt. the five guys quilt is like the hidden wells quilt pattern. sorry for problems with letters and words but my tablet is not the easiest to type with. i love batiks so that is why i choose them. they will last a long time and grow with the kid. 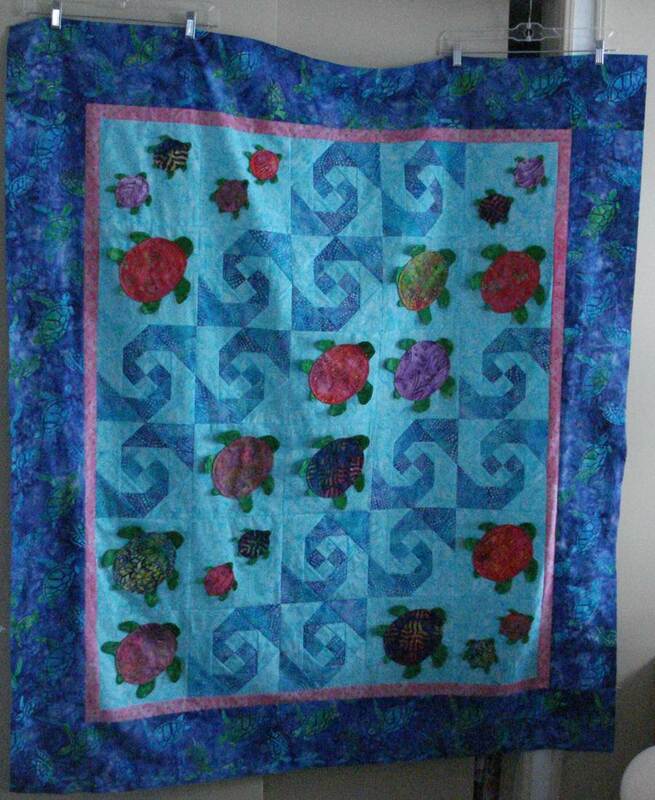 my other two have quilts in batiks. I love your fabrics. Beautiful batiks. You are making me drool. I can't wait to see the quilts. Good luck on the quilt and your visit. Let us know. 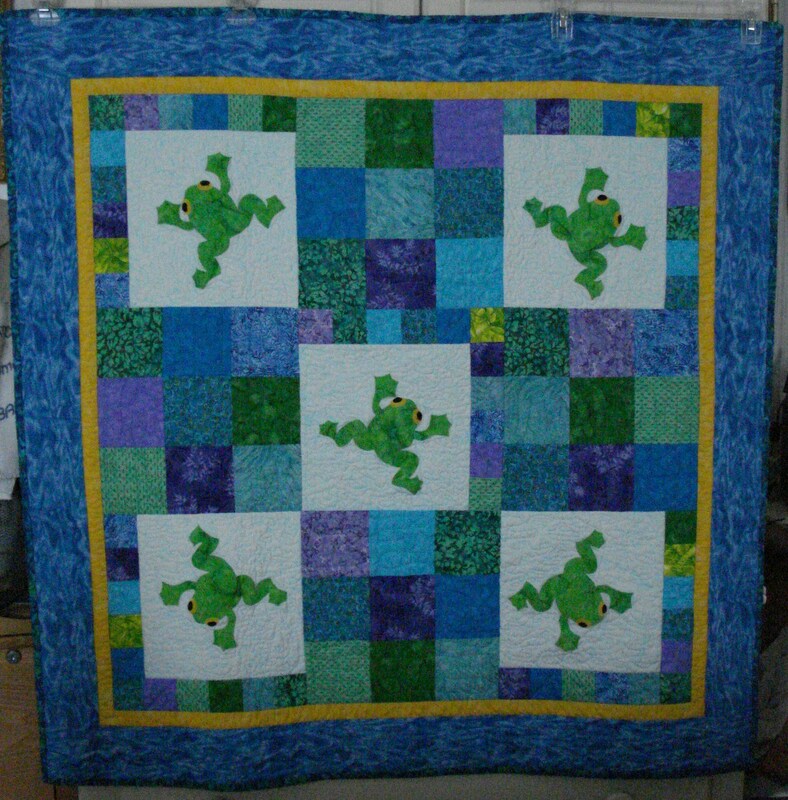 I know the fabrics don't scream baby, but I think a good baby quilt needs to grow with the kid, that's why I always make mine extra big and something that might suit a young child too. that looks like a stacked coin quilt. hmmmm defiantly an idea. Wow. I looked at the fabric and thought, "That's not baby fabric." Then I saw your batik baby quilt and had to rethink that. What a gorgeous use of batik and a really awesome baby quilt. It would look great with Sahm's fabrics. You have some fantastic batiks. Simply gorgeous.